A robust process safety management system is central to any well-managed installation or site. By applying the hierarchy of controls when hot work is required, our pressurised hot work habitats provide the most effective engineering control measure available to manage and mitigate risk. Having enabled more than 10 million hours of safe productivity over the last 17 years, SAFEHOUSE habitats are proven as a cost-effective solution to mitigate risk and remain compliant. 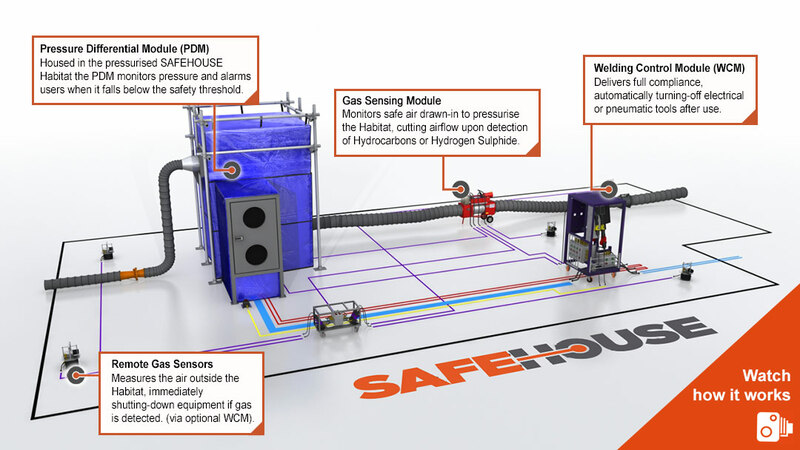 The SAFEHOUSE positive pressure welding habitat forms part of a fully certified ATEX system and control measure, which when deployed allows hot work of any nature to be undertaken in hazardous environments including those designated as zone 1 and 2. Containment – the flexible flameproof panel arrangement provides containment of the working area preventing the escape of sparks or welding slag. Pressurisation – the controlled over-pressure within the habitat provides a barrier preventing the ingress of hydro-carbons or other hazardous gases during operation. The modular construction allows SAFEHOUSE pressurised habitats to be installed to any required size and shape, incorporating penetrations such as structural beams and pipework with ease, ensuring that wherever the work site may be, our habitats can be installed. The high rate of air change within the pressurised welding habitats, and the adjustable air extraction provide safe and comfortable working conditions during the hot work operations, removing noxious fumes as they are produced. 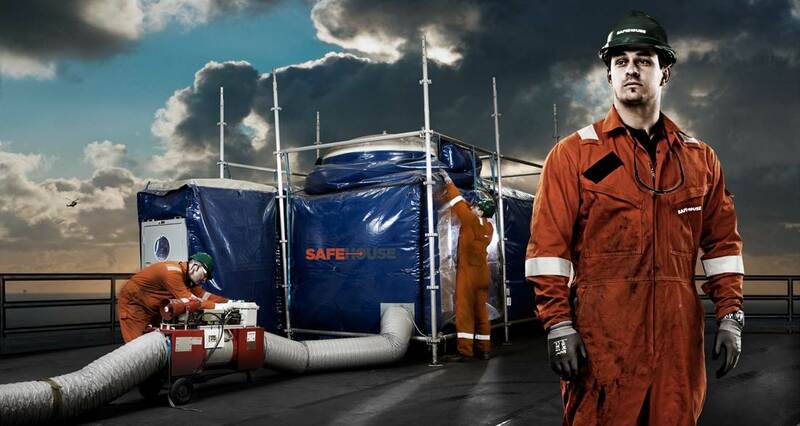 The strength of Safehouse can partly be attributed to it being the world’s first business to achieve third-party ATEX certification of a complete hot work habitat system. ATEX is the the certification standard used in many parts of the world for electrical equipment used in explosive atmospheres and applied as best practice offshore in the North Sea, North Atlantic, Black Sea, Caspian and West Africa. Since then, Safehouse has maintained and enhanced its offering to meet the requirements of its customers globally. Protecting people, preserving assets and improving production by providing engineered protection that ensures work in hazardous environments is universally safe.